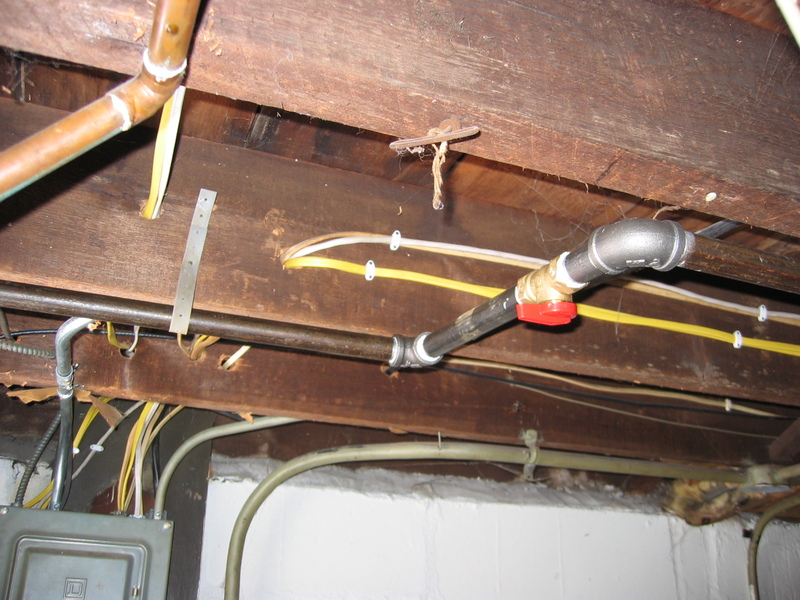 Here I’ll show how I extended my basement’s natural gas piping to go outside. It was a fairly simple affair with the most difficult part was correctly measuring the lengths of pipe needed. The whole basement was run with 3/4″ pipe so I continued this trend with the new pipe I put in. I went down to 1/2″ only very near to the end fittings. My house used to have a gas water heater so luckily there was already a tee available; this one had been plugged off. 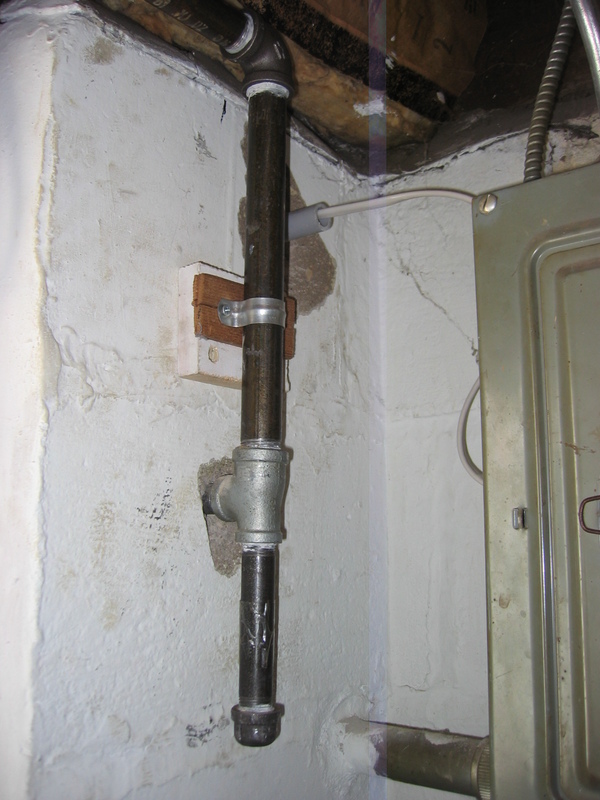 This is a picture of new line heading towards the wall along with a shutoff valve. This is where the pipe runs outside the house. At this point I wanted to go down to 1/2 pipe so I used a 3/4 x 1/2 x 1/2 tee. The “dead end” piece serves to collect any dust or metallic particles that may be floating around in our gas supply. I used 2 toggle bolts to attach the mounting board to the wall; I initially used some concrete bolts but they pushed right out when attaching the gas line from the outside (It’s a quick disconnect so you can imagine how one has to shove the hose into the end). I guess they’re good for sheer but not axial stress. 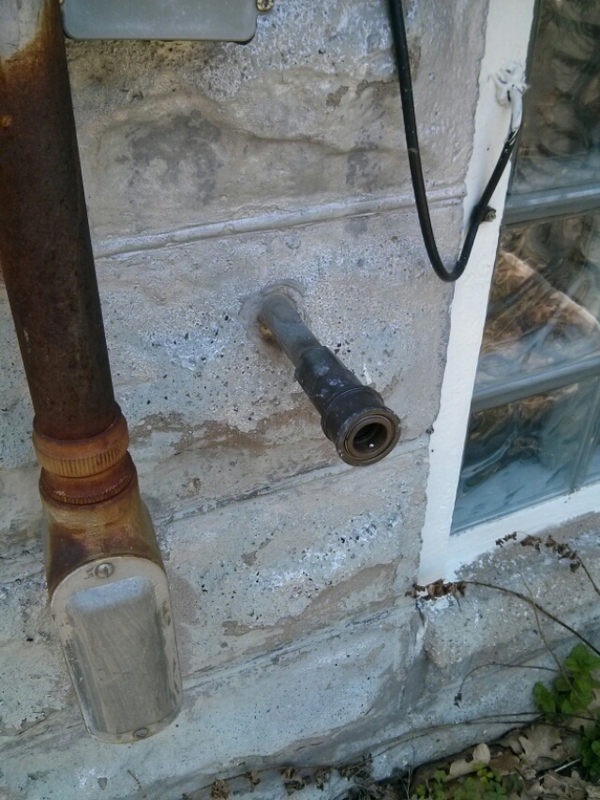 The hole in the wall was a snap because I was able to borrow a 14″ long 7/8″ concrete bit. I used teflon -infused pipe dope on all the threads and they all passed the soapy water bubble test. My advice to someone running pipe is to work backwards from the wall to your source. Because most of us don’t have a pipe cutter & threader at home we have to make accurate measurements at home and then get them cut at the hardware store. 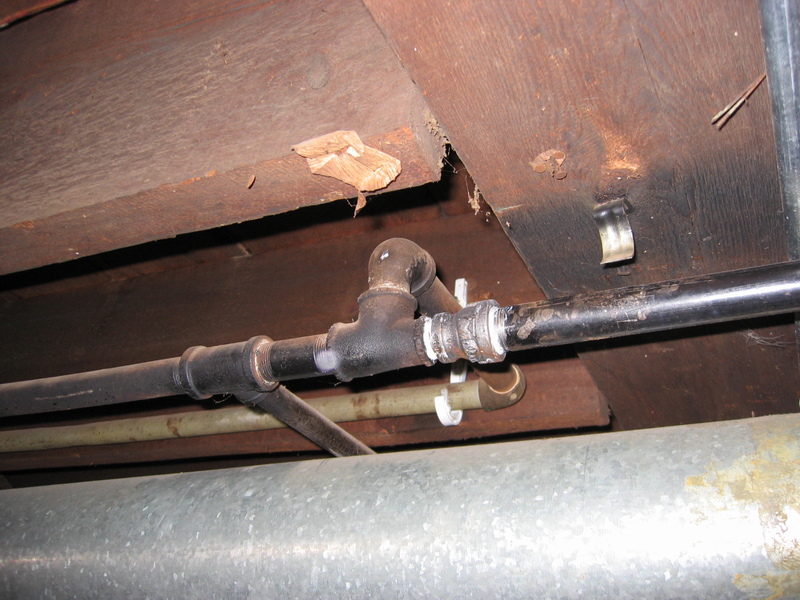 Install your end fittings first such as the tee in the above photo. This eliminates the vagaries of exactly where your hole is drilled. I inserted a piece of 1/2″ pipe through the hole and threaded on the tee and then measured up from there to where I wanted the pipe on the ceiling. Another thing you have to take into account is the size of your fittings and how much pipe length is consumed by threads. Take a look at this drawing of a 3/4″ elbow. 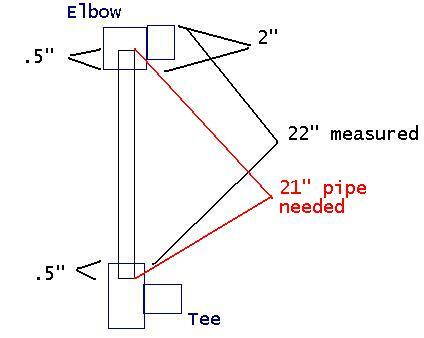 Let’s say I measured 22″ from the top edge of the wall tee to where I wanted the top edge of the pipe by my ceiling joists. When the elbow is snugly threaded on it uses up half an inch; because it’s two inches tall it effectively lengthens the pipe by 1.5″. Therefore we subtract 1.5″ from 22″ for a cut length of 20.5″. However we have to take into account that the pipe will thread a 1/2″ into the tee which adds on another half inch for a final cut of 21″. Tee diagram showing the 1/2″ thread contact length.